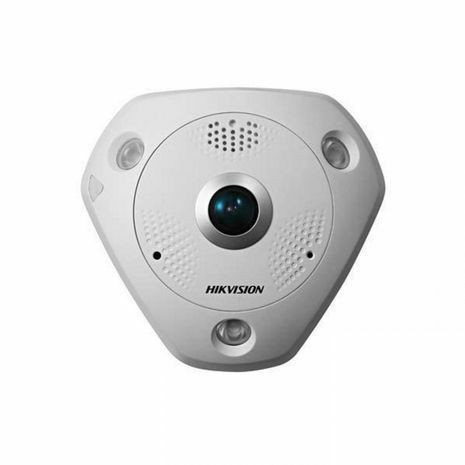 Hikvision DS-2CD63C2F-IVS 12MP 360° panoramic External Fisheye Network Camera. DS-2CD63C2F-I(V)(S) is designed to single-handedly capture images from every corner of a particular location and eliminate blind sports. It features a progressive scan CMOS sensor to provide high-resolution images of up to 4000×3072, and a fisheye lens for a 360 panoramic or multiple de-warped views. Furthermore, IR functionality provides up to 15m IR distance of visibility under low or even zero-light conditions. It is a great choice for detailed coverage of wide, open areas like airports, shopping malls, parking lots, retail stores, offices, restaurants, classrooms, and more.